Companies need innovative way to communicate and collaborate with their employees in order to increase their efficiency and maintain competitiveness. Today, mobility is an ever-present component of efficient communication. However, this communication must correspond to compliance guidelines and be secure, reliable and easy to use. 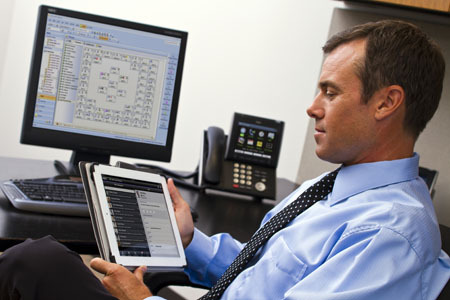 PKE business communications offers a wide spectrum of modern communication solutions, from the Unified Communication and Collaboration solution to call center systems enabling multimedia routing for your customer communication by e-mail and chat to state-of-the-art solutions with high availability for emergency control centers. We offer countless industry solutions with a special focus on the highest availability and security. Together with you, we develop a communication solution that is tailored exactly to your requirements and offers you the required flexibility and expandability to secure this investment into the future as well. Unified Communications and Collaboration solutions, or "UC&C" for short, refer to the merging of different communication media on one user interface. In addition to the classic communication medium of voice (telephony), media such as e-mail and chat are also commonplace today. UC solutions combines all these media on one platform in order to increase the clarity for the user and facilitate uniform operation. The Collaboration portion enables communication within a group based on different media, bringing together teams from disparate geographical areas in one virtual conference room. Tools are typically provided to support this collaboration, such as virtual white boards, video, document sharing and collaborative editing. Especially in control centers for emergency services and industry, a wide range of communication media, such as phone, radio, intercoms and announcement systems, must be available for the dispatchers on one common, clear interface. For this, PKE offers ACC, an IP-based, high-availability solution available with geo-redundancy, which can also be integrated seamlessly into our AVAYSYS® GMS system on request. While IP-based systems are becoming increasingly common today, TDM systems (the "traditional" analog and digital telephone sets) are still highly prevalent, especially in environments where the highest levels of availability are required. TDM uses one communication channel that has unrestricted availability regardless of the user's IP environment, even if the IP network is down (due to error or maintenance). The systems we use can provide any combination of TDM and IP technology you might want. This means we can configure communication systems based solely on TDM technology or as pure IP systems—or any combination in between. IP technology is gaining more and more importance in communications for highly flexible workplace models and globally distributed companies. Our systems feature flexible designs that allow us to cover these requirements in full. Depending on the platform in use, fully visualized installations are also possible that can run in your data center—without any dedicated hardware. The call center has become an integral tool for today's customer-focused companies to provide expert support for customers. In order to match the communication habits of your customers, which are trending more and more towards new media, our call center solutions also allow for the integration of different communication media, following the path set by UC&C systems. Our web and video conferencing systems offer an excellent addition to your existing system so that you can use UC&C functions in existing traditional or even IP-based communication systems, without needing to convert the entire system to a UC&C system. Modern IP-based DECT solutions provide the reliability and availability that GSM systems cannot. This is because there is often a notable lack of sufficient GSM coverage in modern buildings, security zones, production areas, data centers, and similar areas. Operational and security requirements also necessitate mobile 24/7 access to personnel at the site. In addition to the full control over the availability and function of individual transmitters and any necessary maintenance windows, which are not within the customer's control when using public GSM networks, our modern DECT solutions also offer fully encrypted voice transmission and a significantly broader expandability than traditional DECT systems. Individual emergency call systems and safety for solitary workers can be integrated based on the high availability and security of our modern IP-DECT solution. These solutions also correspond to the strict regulations of the German Technical Supervisory Association for individual emergency call systems and have the corresponding certification. As an industry solution for prisons and hospitals, we offer solutions that meet these higher security requirements and which also feature suitable end devices that can be designed to be vandal-proof or resistant to disinfectants, for example, in addition to featuring special industry-specific functions. Light call systems are primarily used in the nursing industry and in prisons. Here, signaling a call or alerting takes place visually in addition to acoustically, generally using multi-colored lamps in corridors. PKE offers a variety of solutions in this area tailored to the respective customer requirements.